Almost time to go home, our last day in Rom. But, we had promised ourselves one more good meal. So off we went, after doing the necessary shopping in an italian supermarket (flour, oil, etc. etc.) and bringing our suitcases to the station (count on 20 minutes for this, you’re not the only one with this plan), we headed of for Monti. I had remembered on time that Hande tipped us about the best lunch deal in Rom, namely 12 euro for a full lunch (antipasti, primi, secundo, water, wine, tuesdays till fridays) in l’ Asino d’oro! Which was our favourite restaurant anyway, so we decided we would give that a try. Of course we northern Europeans were way to early, which left us time for a prosecco sparkling wine in a bar close by. After that, at 13.00 sharp we were hungry and ready for lunch. Indeed, a fixed menu, no choice whatshowever, but that didn’t matter at all. In fact, I sometimes rather prefer the restaurant chooses for me, it is lazy i know, but this way, I will eat things I would otherwise never order, like the antipasti bean soup for instance. This was very nice, a velvetty texture, beany, yes, but not heavy, great! This was followed by canneloni filled with ricotta, which was ‘spiced up’ with herbs, some lemon and some spinach. Good too. And then finally, meat balls with brocolli and tomatoe sauce. That was not spectacular, but just a nice dish. And that, including half a litre of water and a glass go good white wine for only 12 Euro? I think Hande is right and this might very well be the best lunch deal in Rom. Thanks for the tip. I will sure visit this restaurant again, next time I’m in Rom. This entry was posted in ate and tagged l'asino d'oro; bean soup; canneloni; meat balls on April 22, 2012 by esthercooks. And day 17, was easter. Which meant: #matteo day. We were invited for dinner (or was it lunch? cause, it started around 13.00. Then again, it finished around 23.00? hmm). I was a little excited, cause i didn’t really know anyone. of course I had met Hande and two other guests during the tasting two days before, but still. Expectations were high, I had been told so much about this by my girl, how nice the people were and the food and that last time she was there two years ago, she had been there for 12 hours. This dish was followed by a pasta with red chicorei, also a little bitter taste, and it occured to me that my taste has been developing over the last two years or so. It wasn’t that long ago that I really didn’t like these bitter tastes, but now, I enjoy them, and I think it is a very nice combination to any meal that probably has sweet, and salty notes anyway. After the pasta, we had a longer break, cause Matteo, the baby goat, had to stay in the oven a little longer. He was in there ever since 8 in the morning and not allowed to leave it until at least 16.00. I think in the end, he was in the oven for over 10 hours, cause we waited for a friend of Hande and Theo to join for the main dish. The baby goat (a whole goat, without it’s head, that is) was put in the oven with herbs (rosemarin, sage I think) and garlic and oil. This was served with some kind of vegetable, I forgot to ask its name, it was a bit like endive, but milder, with olives, pine nuts and raisins. And the of course roasted potatoes. Lucky us, again, such a nice meal. The goat tasted completely different from what I expected. I thought it would be more like lamb, but it remembered most of organic chicken or maybe rabbit (but much less dry), it was still very juicy, and had a very fine taste, lightly herby, but not too much. yummie. Now, the only thing left was desert, which was zabagione like, with fresh strawberries (hmmm can’t wait for them to be in season here! ), and cream. Oh, and I completely forgot the wine. hmm, well, no wonder, i guess, cause, I counted afterwards, and I think we drank at least 13 different wines. Start was Prosecco, then two white wines (of which I only remember that the second one was absolutely great, and the first one was called difficult by Hande.). Then an experiment with two white wines, which were the same apart from the fact that one had and one did not have undergone the maleolactic fermentation. We had to guess on the basis of colour, smell and taste, which one was which. We all had it right, the smell was completely different, both were nice, but the first one, without the maleolactic fermentation most of us preferred, fresher, lighter, a somewhat cleaner taste. This was followed by two red wines, of which i remember that they were: great, and they had crown caps. (i have to get a system to remember those wines, i can remember the food and how it was done, but not the wines…such a pity really!). And after those two reds I think at least 4 more different reds followed, as well as two desert (austrian or german?) desert wines. No wonder that I do not remember the exact names of the wines anymore. Only thing I remember is that i liked most of them a lot. What a nice afternoon, and evening it’s been. Such pleasant company, nice conversation. Great. Thanks Hande and Theo for the hospitality! This entry was posted in ate, drank and tagged matteo; goat; puntarelle; peas; pasta; wine; zabagione on April 15, 2012 by esthercooks. And yet another day in Italy, Rom on which we did everything right, well foodwise, that is. Cause first, we started with a visit of the vatican museums, which is really beautiful and all, but: DON’T GO on the easter weekend, cause the rest of the world is there as well. It was beyond crowded, at times utterly unpleasant. But, the museum was beautiful as always and we concentrated on a few things, and then it was ok. After over two hours of museum we deserved some food. Good thing was, we got a tip form Hande to go to the pizzarium, close to the metro stop Cipro, close to the museum. Very good tip. We were warned on beforehand that it was the best, but probably also the most expensive pizza in town, both was true. The pizzarium is extremely small, you can only eat outside, standing or sitting on the sideways. There is a little ‘shop’ in the front, where you see all the pizzas and can ask for which one you want, and also how much, cause they cut you a piece from a bigger rectangle pizza and then warm it again in the oven. Which was perfect, cause now we could try more tastes of course. We had four, one with beef and tomatoe, one with ricotta and broad beans, one with peas and broad beans and…what was the fourth type again???? hmm I forgot, pity. Drinks you could take from a fridge and they are fun too (most seem to come from the slow food movement). We found a very special rare Dutch beer there, which I think is hard to find even in the Netherlands. After you pay, you have to wait a bit, cause the pizza goes back in the oven, and then you get it on a wooden plate, and you can eat it outside, on the sideway. Definitely very very very good pizzas, a thick crust (not roman style), lots of filling on it, very good and fresh products, interesting combinations. And this was only lunch! 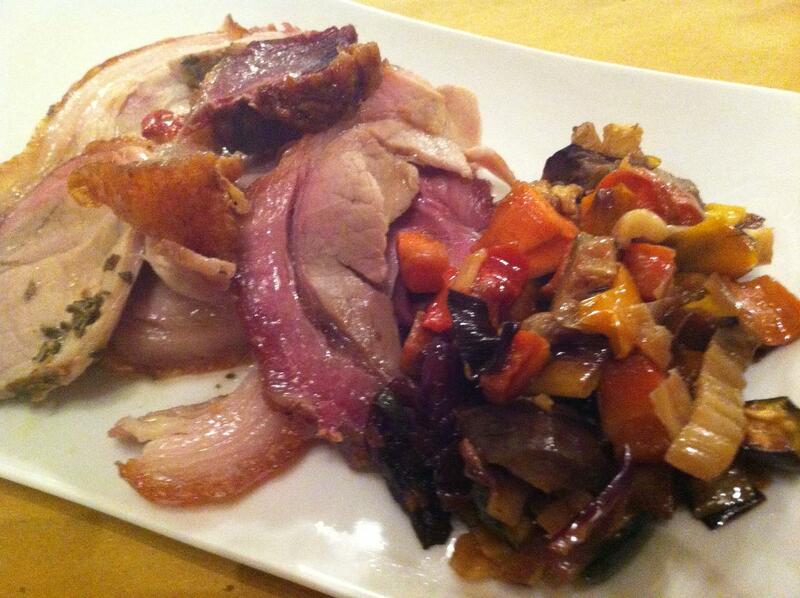 For dinner, we went to another recommendation, l’asino d’oro, in monti, Via del Boschetto 73. We were there relatively early around 7.30 (too early for Rom) and made a reservation for 21, which was a good idea, cause it’s -for good reasons- a very popular restaurant. Not the cheapest one in town, but also definitely not expensive. Very friendly waiters, nice and relaxed atmosphere, and the best food I had in a restaurant in quite a while. Very original dishes, creative combinations, extremely well made. perfect. 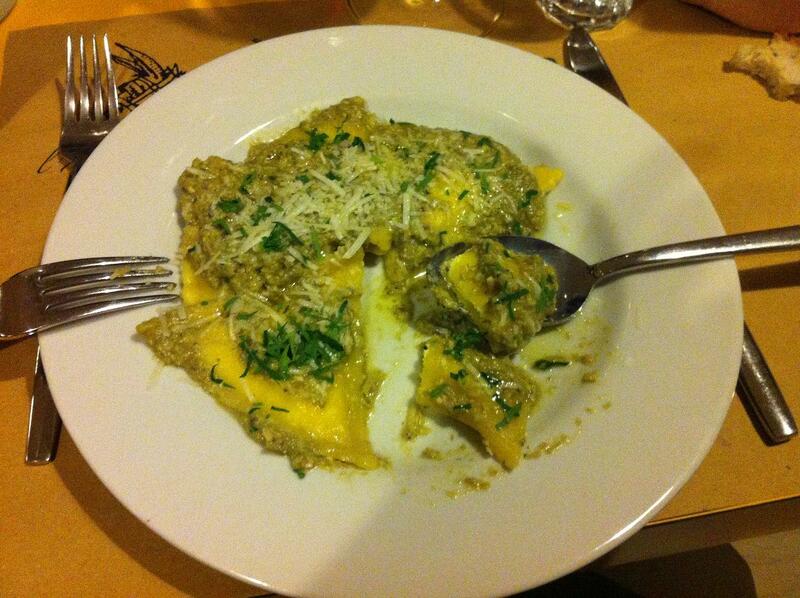 The first is mine, ravioli filled with ricotta with a mild lemony taste, and a (green) asparagus- pinenut pesto. And this pesto was absolutely amazing, such a nice mild taste. All in all, a great dish, I hope I will be able to replicate it at home, not gonna be easy I’m afraid. 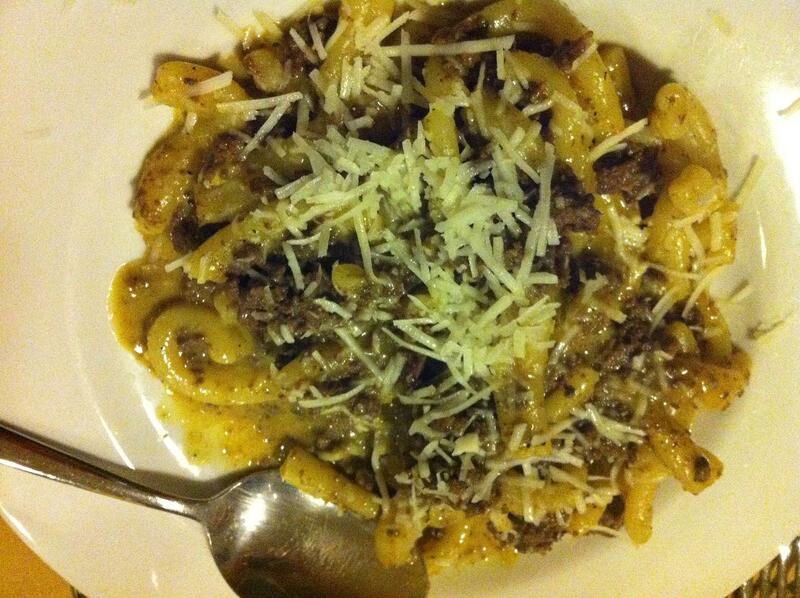 My girl also had a very good choice, a strozzapretti with wild boar sauce. completely different from mine, but also extremely tasty. Then Secundi: here the pictures are not so good, especially the second one looks, well, not too appealing. But the smell! Wow! 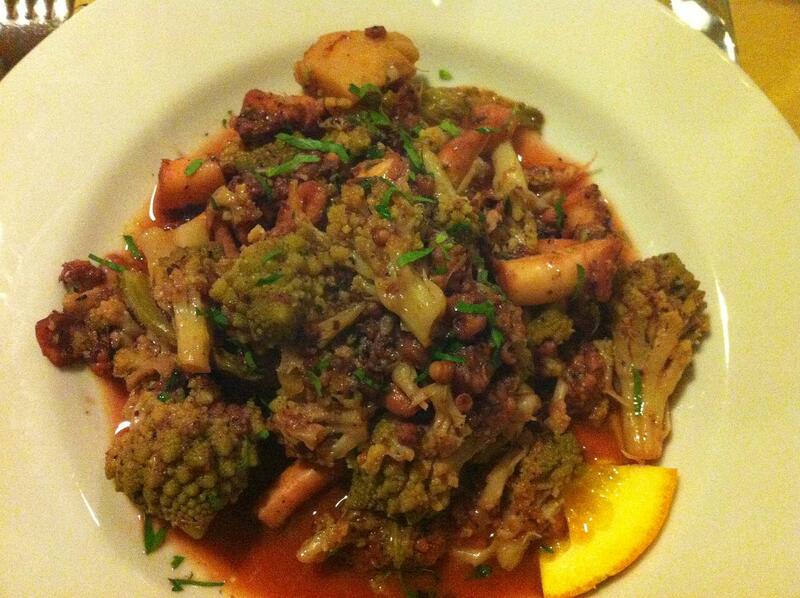 : The first is pulpo with brocolli, which i didn’t taste, cause it I didn’t want to mix the taste with mine, since it was such a completely different dish. Anyway, reports were very very positive on this one. 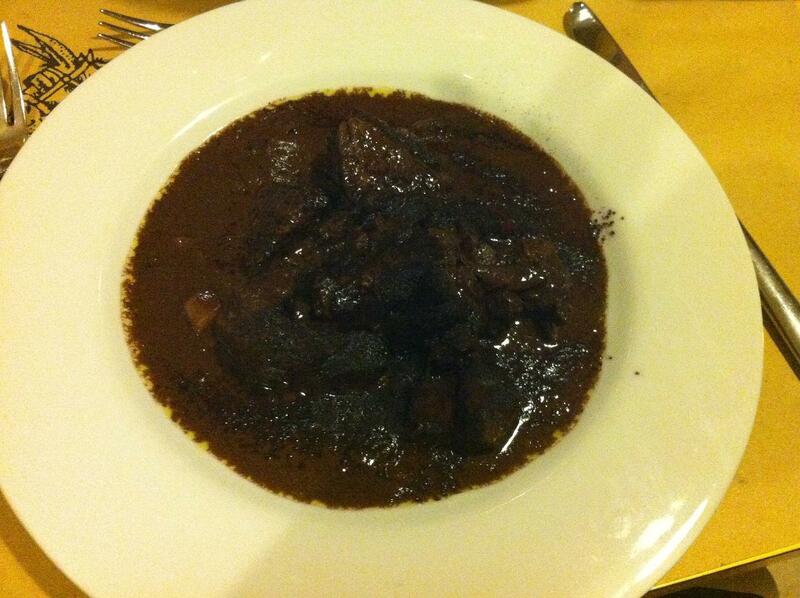 Then mine: wild boar in chocolate-vinegar sauce. yes. really. It was absolutely delicious. A very strong taste. In fact, every bite was a little explosion in my mouth. Very exciting dish, almost a little exhausting to eat, cause the taste was so strong. again, wow. Finally, we decided we could not eat anymore, but there was no way around it, we had to try a desert in this great restaurant too. 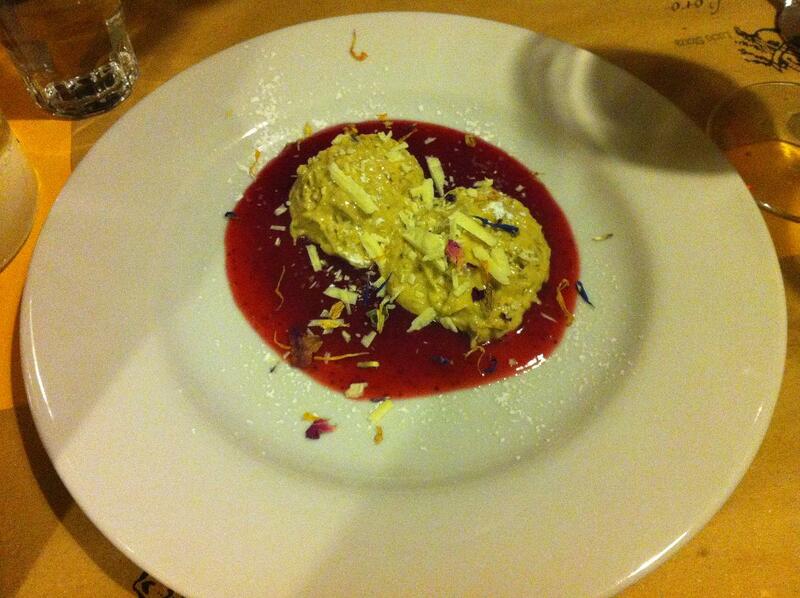 Zabaione, with almond, and strawberries. hmmm. Lecker. This entry was posted in ate and tagged l'asino d'oro; ravioli; wild boar; strozzapretti; asparagus; pulpo on April 15, 2012 by esthercooks. And another great day in Rom. The weather was beautiful, and although we had not had much sleep at all (noise hotel), we were happy to go and walk around. Our first mission of the day was the campo di fiori, because of the market there. The market was great, nice atmosphere, a little bit too much for tourists to my taste, but still, the stands with al the different vegetables are just beautiful. I wish I had them here too. After that we walked to Trastevere, to enjoy this nice part of Rom, and of course to find a good place to eat. Luckily not only I have a good food memory, cause here my girl recognized a restaurant from her last visit, namely Da Augusto, a loud, small, crowded, and I think what you’d call very authentic restaurant. No menu, or if there was, we didn’t get any. Our food italian is enough to get something nice though, and we had ‘just a pasta’, a great ravioli, filled with ricotta and spinach. On top of it a meat sauce, which as the waiter had said, went indeed perfectly well with the ravioli. Simple food, simple restaurant, but good food! Now, the day had just started, hadn’t it! In the afternoon, we had a very special appointment, namely to a wine tasting at vinoroma by Hande Leimer, the owner of vinoroma and a twitter friend of my girl. We got their for a special, namely Signs of Spring. And spring it was. We were 9 in total. Hande first explained some things about wine and tasting wine, the way to look, smell, and taste (two sip method: first a small sip, so that the taste buds get used to the wine and then a bigger one, to really taste the wine) and then we started the looking, smelling and tasting ourselves. We were all encouraged to say what we had smelled, or tasted and then Hande would explain where that came from. All in all, we tasted 7 wines, 3 proseccos (sorry Hande) sparkling wines, 3 white wines and one really dark rose wine. Not all were my taste, which I of course had not expected anyway, but all were special wines. For instance the Colli Trevigiani IGT from Fratelli Cosmo, a prosecco sparkling wine made by the Metodo Rurale as it was called, a very acidy wine, which almost tasted like apple cider. Very interesting, I think I liked it, but maybe not for everyday drinking. What I did like for sure was the franciacorta,a prosecco sparkling wine from lombardia from il Mosnel, a name to remember….lecker! From the white wines I think I liked the Fiano di Avellino from Vadiaperti best. I should have made notes though, it is so hard to remember how each wine tasted and what exactly I like about it. What I do remember very clearly is that I especially liked the ones that tasted very clean (or as my girl put it: cold), I think in general, that tasted better than the creamier/oilier ones, for me. So vinoroma: very good tasting in a very informal atmosphere, not posh, nothing with the noses in the air, but a down to earth and funny wine lesson. Hande knows a lot about each wine, how it’s made, what makes it special, etc etc. and you can simply ask anything, without feeling stupid. Really nice. After the tasting, we went to eat to ‘La Carbonara’ in Via Panisperna. Apparently, a very popular place (crowded). We drank a white wine (of course, after the signs of spring, what else could we drink), a frasciati. We started with a shared portion of fried vegetables, which were done perfectly, tasty, not too greasy, a little salty. very nice. After that I ate straccetti, cause that was one of the main options, I had no idea what it was and just hoped it wouldn’t be a funny organ, turned out it is really finely cut beef, in my case with cheese and truffle. It tasted nice, but it was a bit too heavy for me. The saltimbocca on the other side of the table was much much better. Or I should say, more to my taste. A nice buttery, lemony taste with sage, very tender meat. hmmm. I really wished I had ordered that too! Now, although the food was good, we probably wouldn’t go there again. The service was not particularly nice, some waiters were rather unfriendly and all in all it was very hectic. Pity really, cause the food was good, and so was the prize. This entry was posted in ate, drank, Uncategorized and tagged da augusto, italian food, prosecco, ravioli, trastevere, vinoroma, white wine on April 11, 2012 by esthercooks. Time to leave Siena, and head back to Rom to pick up my girl from the station and have a few days vacation in Rom. During Lunchtime I sat in the bus from Siena to Rom, which takes about 3 hours. I had bought a nice panino with salame, which was freshly made, and the salame was great. I arrived in Rom around 4pm, had enough time to go to my B&B (well, B, really, since they didn’t serve breakfast) and walk around a little, before picking up my girl (finally!). We had reserved a table in Trattoria Morgana, which we both knew from an earlier vacation to be good. Service is not the friendliest in the world, but it is ok and the food and wine are great for a very reasonable price. We ordered a white wine from Lazio, namely a Satrico Casale del Giglio, new to me, a very fresh dry white wine. We liked it. As a starter we had a proscuitto e mozzarella (she) and a bresaola with rucola and fresh parmezan (me). Both were excellent, the meat was great, very tender and just really good quality, and so was the cheese. we drizzled some great olive oil on it, and knew: it was definitely the right decision to have a short vacation in rom. For secundo (we skipped primi sorry) we both had fish, solefish (she) and seabass (me) both from the grill, and as contorno an artichoke made in roman style. Here too, we were very happy, the fish was grilled very well, not too dry, and very fresh. The artichoke was nice too, although i think I do like the small fried ones from Siena a little bit better. No room left for desert, but some for a small grappa morbida. Such a good start of our vacation all in all! This entry was posted in ate, drank and tagged bresaola; satrico, carcioffi, italian food, rom, sea bass on April 11, 2012 by esthercooks. So lunch we can forget, ice cream from gorm again (this time nuts and the salted caramel, nice again), as well es leftovers from the supermarket stuff i bought. Really nothing to write about. But then dinner (I seem to need to compensate for the last two days, I was told I sound like I need to go home. Now, this is true, but, I still thought I could improve the sound of this blog, here goes:). I went to the restaurant my colleagues from Siena took me too, Il Ghibellino (it surprises me the reviews aren’t better), and i promised myself to have some good food. This worked out well. 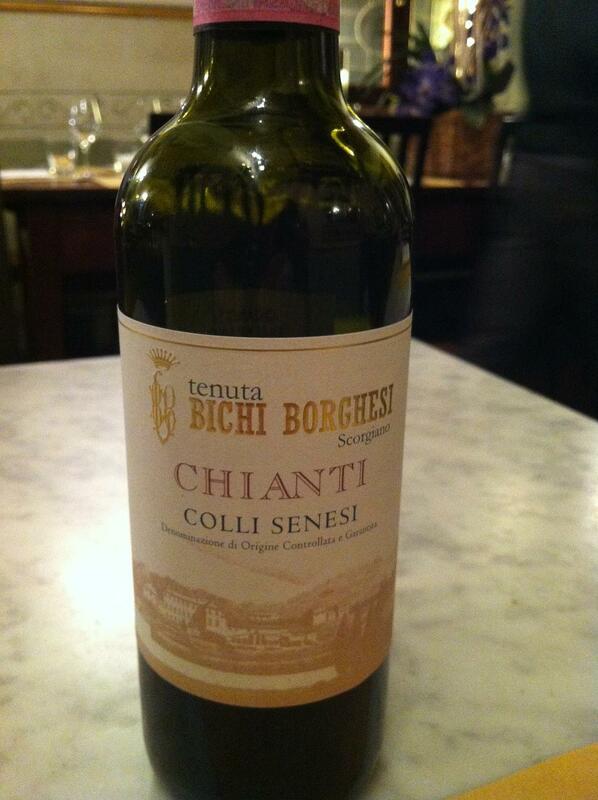 Anyway, Chianti, from Siena, it was nice, smooth, dry, not too dry, and not to harsh either. I liked it. Then I order my food: carpaccio di petto d’ oca con radicchio rosso and prosciutto di maiale al forno con macedonia di verdure. Turned out, I had a good day of food picking. The starter was a very nice carpaccio of goose meat, which I think was smoked. It almost tasted like ham, but more subtle, and it went very well with the bitter taste of the radicchio. It was dressed with some good olive oil and lemon, and all in all…great. I liked the combination of the somewhat smokey meat and the bitter (but crunchy) radicchio, maybe I’ll try making something like this at home myself (more then enough goose meat there). The main dish was nice too, ham, with herbs roled in it (rosemary, sage, thymian I think), and then baked in the oven with mixed vegetables. Important knowlegde as it turns out. The grappa was, in fact very mild and nice. 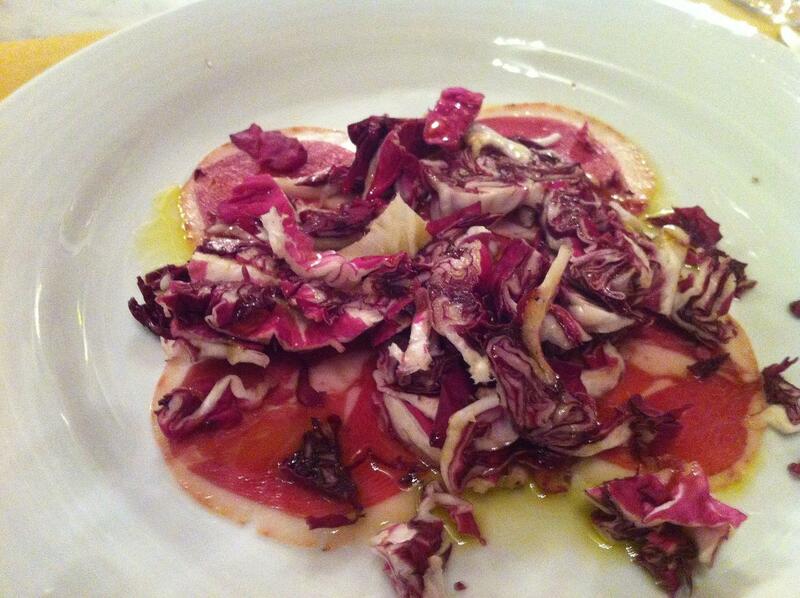 This entry was posted in ate, drank and tagged carpaccio, chianti, grappa, ham on April 4, 2012 by esthercooks.